My Microschool's inaugural course, "The Passionate Learner Project" is underway. Tn incredible Superhero Learners (who are currently in grades 4-12) and their Parent Allies have taken a risk with me, as we experiment with a new way of learning! Superhero Learners are using digital literacy skills to answer the question: how might we change the world in one day? They will complete 24 hours of work in the next 10 weeks. Together, we are creating a game that will guide their highly personalized and passion-based learning. They are working their way through the several quests in Mission 1: You Are a Superhero. They are exploring what kind of teacher they need and what kind of learner they are. 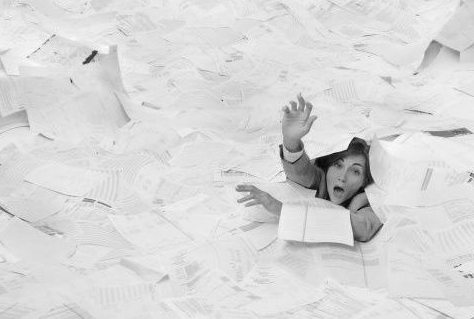 Learners work their way through the Mission Dossiers I send to them at their own pace, in their own way. In the coming days, each learner will launch a Digital HQ where they will document their learning. I hope you'll follow along and add to the conversation! We need allies to cheer on the learners, challenge their thinking and add their influence. We are so happy to welcome Lisa Paterson as a Yoga coach to the Superheroes in Mission 2. If you want to be a part of The Passionate Learner Experiment as an ally, let me know! We have space for a couple more learners to come on board if you know anyone who would like to play and learn with us! In our increasingly connected world and global economy, it is more important than ever to equip and empower youth with the skills and knowledge to be globally competent. They need to be taught how to learn about, communicate with and take part in their local, national and global communities. Successful high school graduates should be able to demonstrate excellent communication skills, empathy, critical media literacy, cultural sensitivity and collaboration. They should have an understanding of the history of their own cultures and the world. They should know how to effectively use maps, charts and graphs to learn information about geography. They should be eager to share their stories and learn the stories of others, with open hearts and minds. How can you empower youth with global competencies? The video above describes what the world would look like if it was made up of 100 people. It's a great starting point for discussion about global inequities. There are further statistics, videos and lesson plans and information about The 100 People Project available online. This Child Every Child - a book containing many more statistics that compare the lives of children around the world. Jenny Buccos is an amazing human being and her Project Explorer inspired a whole lot of great learning for EPCOT class last year. She is leading a mission of creating 10 million globally competent youth by 2020. The free videos on her website are helping to do just that. One of the most powerful ways for kids to learn is from other kids. If you can, connect your students with students from around the world. Skype in the Classroom helps you connect with other classes, experts and virtual field trips. If you haven't tried a Mystery Skype yet, you have to sign up! The Global Read Aloud, run by my incredible friend, Pernille, unites classrooms around the world, as they read the same book (there are choices based on student age) every fall. In October, Stand Up for Girls. Learn about why so many girls around the world are not given an opportunity to have an education, and demonstrate your support for them by literally standing up for girls. 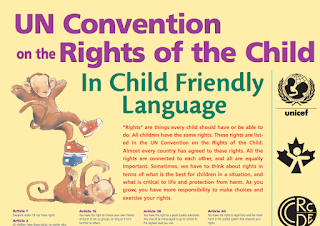 Share and post the UN Convention on the Rights of the Child, in child friendly language, in your classroom. Illustrate and write about what each of the rights mean to you and your students. Years ago, I did a project where I collected drawings depicting the rights here in Canada and then had students in Lesotho, Africa, draw their representations as well. I Have the Right to Be a Child - simple, colourful book exploring all childrens' rights. Fundraise $25 (or $50 or $100...) and, as a class, invest in a real person. 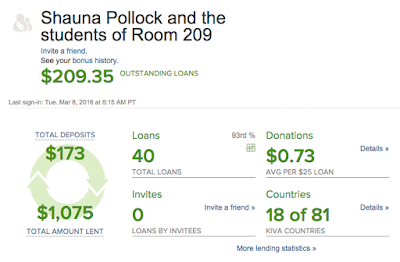 Visit Kiva.org and start a lending profile. You will be able to relend your loan over and over and over! 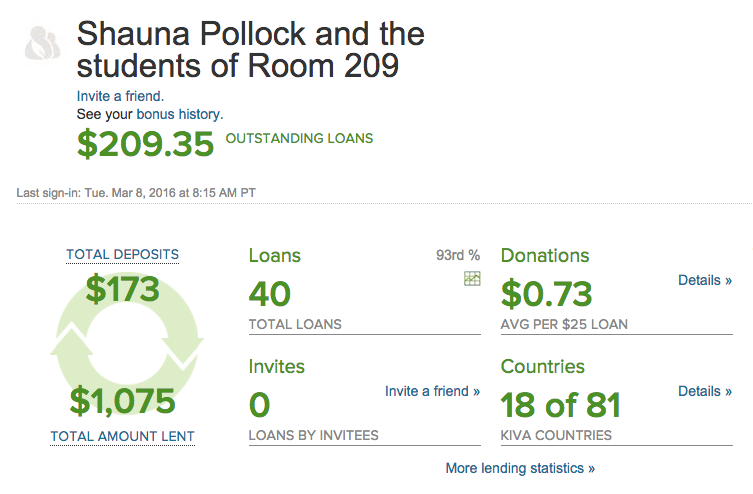 My students and I have put under $175 into our account and that has allowed us to lend over $1000! Iqbal and Malala - The stories of an Indian boy and a Pakistani girl who demanded education and faced incredible violence from adults as a response. These stories open a students' eyes to how differently education is valued around the world. Malala Yousafzai: Warrior with Words - by now, you surely know about Malala, the youngest every recipient of the Nobel Peace Prize. This book is, "a testament to the power of education to change the world for boys and girls everywhere." "Young Nasreen has not spoken a word to anyone since her parents disappeared. In despair, her grandmother risks everyone to enroll Nasreen in a secret school for girls. Will a devoted teacher, a new friend and the worlds she discovers in books be enough to draw Nasreen out of her shell of sadness?" "It's the first day of school in Chad, Africa. Children are filling the road. 'Will they give us a notebook?' Thomas asks. 'Will they give us a pencil? Will I learn to read?' But when he and the other children arrive at the schoolyard, they find no classroom, no desks. Just a teacher. 'We will build our school,' she says. 'This is our first lesson.'" "Ana loves stories. She often makes them up to help her little brother fall asleep. But in her small village, there are only a few books and she has read them all. One morning, Ana wakes up to the clip-clop of hooves, and there before her, is the most wonderful sight; a travelling library resting on the backs of two burros (donkeys) - all the books a little girl could dream of, with enough stories to encourage her to create one of her own." Ryan and Jimmy - the true story of a young boy in Canada and his Pen Pal in Uganda and the water project that turned them into brothers. Shannen and the Dream for a School - this is the story of Shannen who demanded that the Canadian government create better schooling options for her and other aboriginal youth. Where Children Sleep - the most popular book in my classroom for years, our copy has needed many repairs! You can see photos from the book online and project them into your classroom to encourage discussion. On your class blog, share what a day in life of your students looks like - use pictures, videos and/or writing. Share your learning, projects and adventures on a class Twitter account. Make videos and have a class Youtube channel to tell your learning stories. 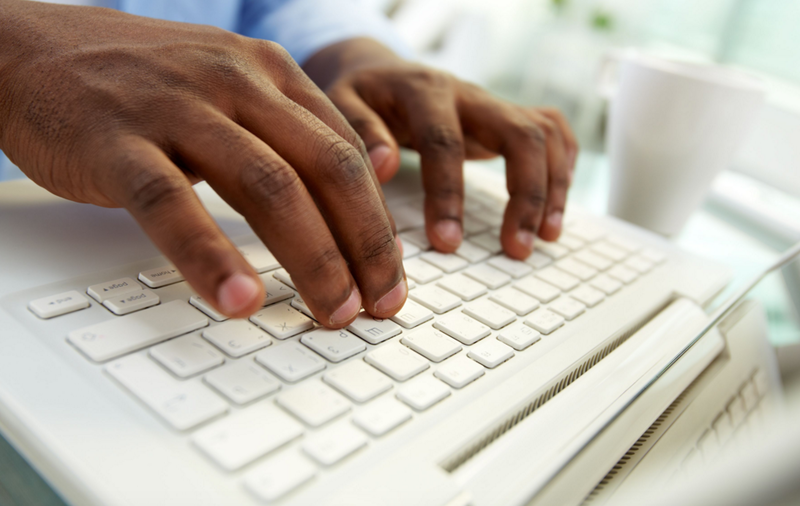 Respond to people's comments, visit their projects and learn together. Fill some free time in the classroom by practicing your vocabulary or times tables (or a number of other topics) and, for every correct answer, the World Food Program gets rice to give to people in need. Play FreeRice! Set up a class account on We Give Books. For every book your your students read online (extra awesomeness for reading with younger or older Reading Buddies! ), Penguin donates books to children who need them! Ask your students what problems they want to solve and be a Collaborative Curator to support them. Curate great information and collaborate with them to make a plan! 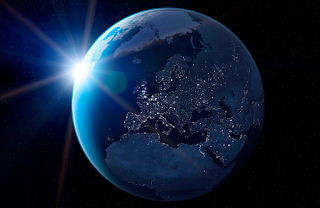 How do you empower your students and help them become globally competent? Share your ideas below! Thanks for spurring me into action, Sylvia! 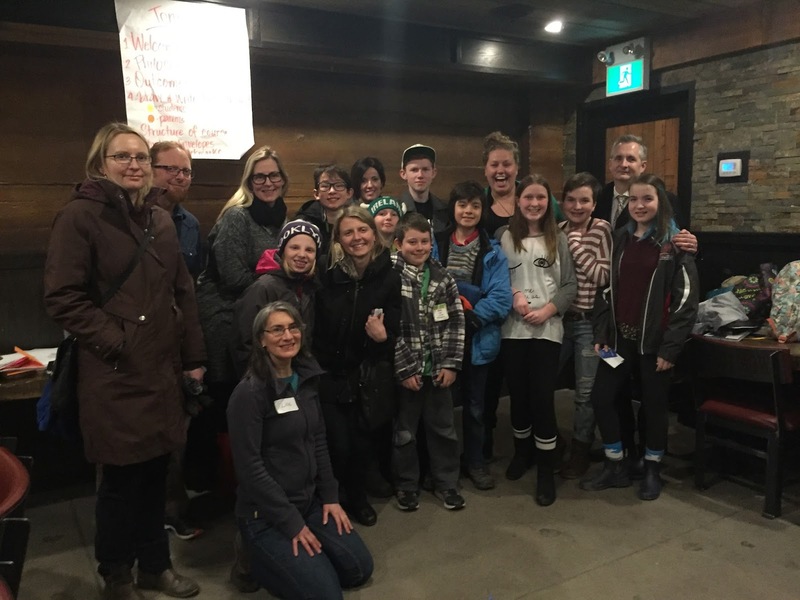 Dear Grade 4-12 Student, How Can You Change the World in One Day? Do you want a chance to be a part of a brand new learning experiment and be a model of how we can disrupt and design education in a way that REALLY works for learners? You can be one of the first students at the Experimental Prototype School of Tomorrow (EPSOT) starting on March 22nd, 2016. There are four spaces left in the first cohort! 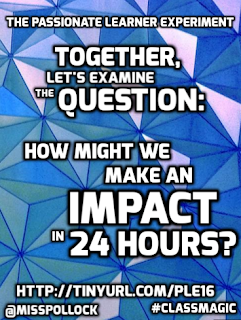 In 24 hours of online work, you will explore the question, “As a digitally literate person, what can I make in one day?” You will pick your own path to explore this question and can do the 24 hours of work at any rate you choose. Your teacher, Shauna Pollock, will be your guide and collaborative curator, working alongside you to learn and practice new skills, discover new tools and apply your learning to a self-selected project. Your classmates in this first cohort will be on parallel learning journeys of their own and you will learn how to collaborate and communicate with them online. This is a chance to hack your learning and help shape what education can look like in 2016. We will use digital literacy skills to help you uncover and explore your passion. You will be empowered to pursue a self-selected project and share it with a real audience. Where do ideas come from? Reading. Writing. Thinking. Those moments when I am not multitasking and have to focus on showering or driving. Conversations with amazing people. A need that has to be filled. Watching TV. Sometimes the ideas all merge and meld together and a truly beautiful one emerges. For the past several months, I have gotten to live in a world of my ideas more than ever before and it has been incredible. I have spent many hours alone, moulding my ideas, memories and stories into my book. I have gotten to talk to fascinating people who are following their dreams, innovating and making the world a better place. My ideas have gotten bigger and better through conversations with them. I have started a business that is dedicated to making learning experiences more magical. I empower learners to understand themselves, make discoveries and solve problems. I have been working with teachers, business owners, entrepreneurs and innovative thinkers. The group I love the most and miss the most is students. I have a dream to open a grade 4-12 physical school that takes everything I’ve learned through research and experience and apply it, creating a whole new educational model - a prototype that others can learn from and follow. For a long time, I’ve been saying that’s my “Ten Year Plan” to open a school. Suddenly, I wondered, “Why wait?” Nothing happens overnight, but the first iteration of an Experimental Prototype School of Tomorrow (EPSOT) is formed in my mind and in files all over my computer. 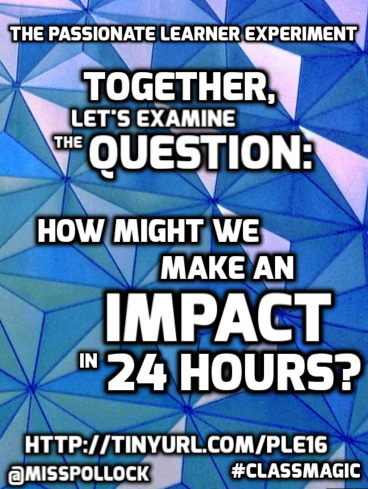 Why not bring it to life with a small group of motivated learners who can experiment with me? Over the next several weeks, students in the course will choose their own learning adventures and be expected to spend twenty-four hours working on their projects. I will guide them through this experience, collaborating with them, curating information and learning with them through online media (such as email, Google Drive, Google Hangouts, Twitter, individual blogs, texting and/or phone calls). We will also have at least one virtual visit as a group to check up on progress and one in person event in Ottawa, Canada to celebrate and share our learning. What I am offering is an individualized online learning experience for your child (grade 6-12) where they learn about Digital Literacy. They will learn important lessons through online learning modules that will require them to spend a total of twenty-four hours online, working independently (reading, watching videos, writing), responding to others’ work, collaborating (live and asynchronously) and sharing their discoveries. They will use their newly acquired knowledge of Digital Literacy to complete a self-selected Passion Project answering a guiding question that they will self-select. This course will be highly dynamic and collaborative. I will create a framework for it and, together, the participating students and I will shape it to fit their needs and interests. My hope is that this experiment will teach us all a lot. I hope that we will find that we can effectively use online tools to learn more than we’d ever imagined. I plan to use our discoveries and deliver this program to many more learners. I need for you, as a parent or guardian, to be willing to jump into this experiment with me and support your child's learning. I need the learners’ commitment to participate in fun, interactive learning modules. The course will be highly responsive to students' needs and can be completed at their own pace and will be shaped by their own ideas. They will explore and make discoveries about Digital Literacy. They will apply that to their self-selected project and create digital content to demonstrate their learning. This course starts on March 22nd, 2016. If you know of a learner who would be perfect for this Passionate Learner Experiment, there are a few spaces in the inaugural cohort that are still available (as of March 15th, 2016). You can contact me via this blog or email at shauna.pollock@gmail.com to get more information (including cost) and an online registration package. I'm starting to play with the responses to my ‪#‎rethinkhighschool‬ survey. The two images below represent the answers to two questions. #1. Describe your high school experience in one word. #2. 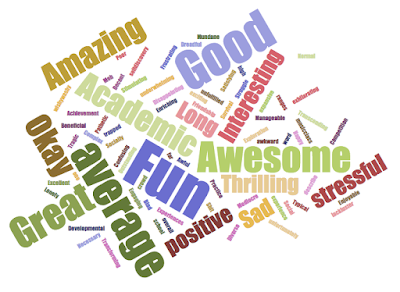 Describe what an ideal high school experience could be. Are you surprised at the results? What would you add? I have been working with an incredible young entrepreneur in Toronto. Kevin Munn has worked in education for seven years. He has been a Child and Youth Worker, ESL teacher and tutor. I know that I would have loved to have had Kevin work with me and my students. He is responsive to student needs and interests, creating games for them to learn and practice skills. Games helped Kevin learn when he was a student and he created games for the students he worked with. Students with a variety of academic, social and emotional needs responded positively, engaged in their learning. 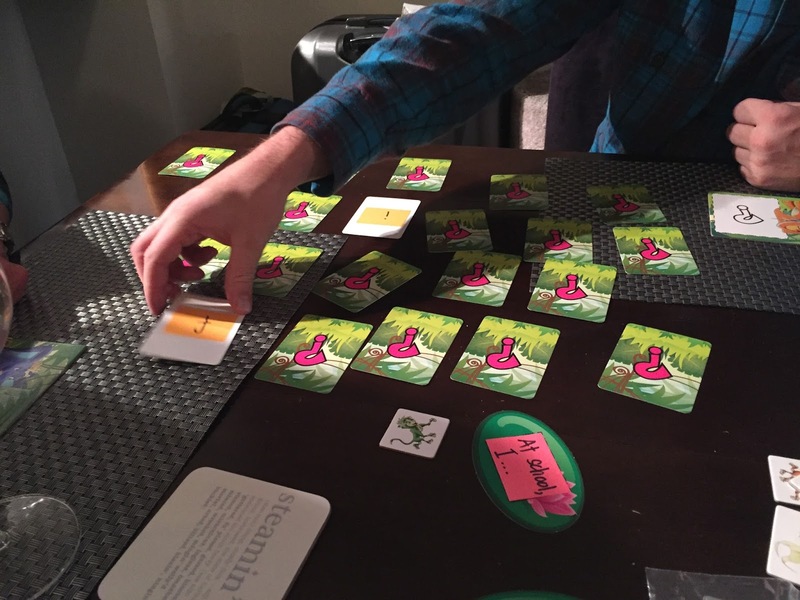 His games became popular with teachers and he created sets for them, even buying his own personal laminator to set up customizable games for them. This year, Kevin's company, Hungry Minds Academy has created "Academy in a Box" - four fully-customizable card and board games for students. 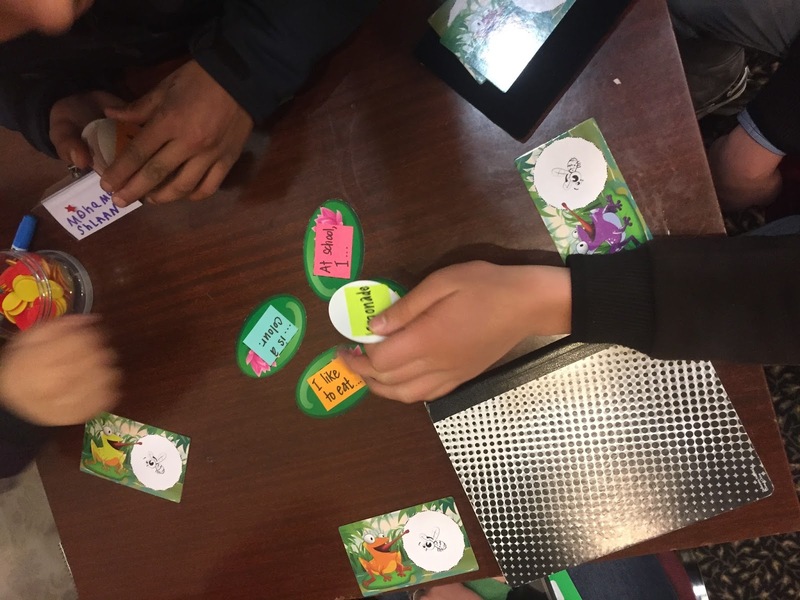 I have been using several of the games with my Hotel ESL class and the Syrian refugee youth have been able to understand and engage with them easily. 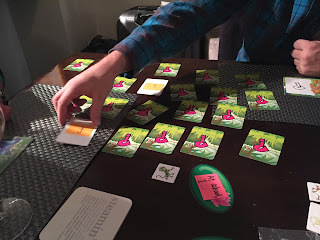 Kevin is joining #cdnedchat tonight from 8-9 p.m. EST for a chat about the importance of play, particularly about why we should and how we could use board games in the classroom. He is passionate about empowering students to learn at home and at school and has done the research to back up his product line. Tonight, Kevin's questions are based on a five-year evidence based study (including the complied results of sixty independent studies) about the benefits of gameplay on learning. 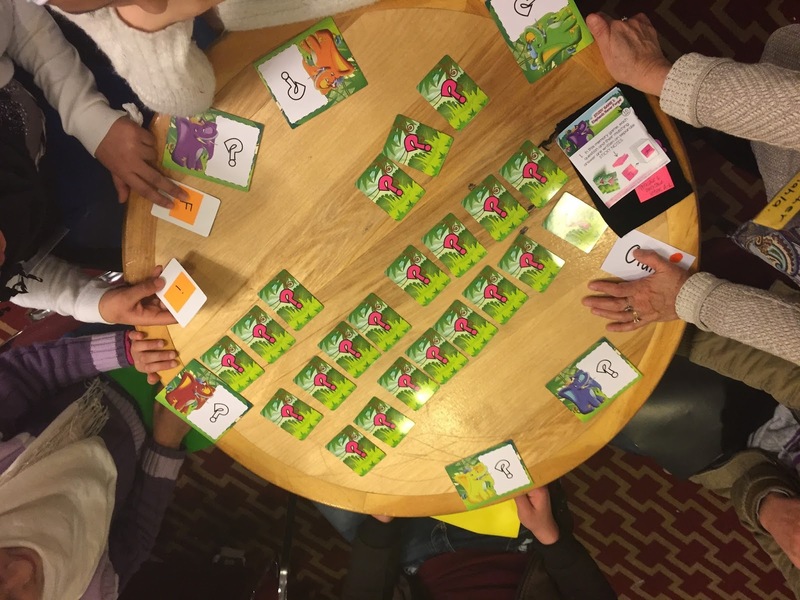 Q1: How do you use games (esp board games) in your classroom? Games are inherently engaging to most students, but how they are used determines how effective they can be in a classroom. Teachers who use games deliberately have the best results. Q2: How do you use inconsequential competition in class? If games do not focus on important academic content, they will have little or no effect on student achievement. Q3. How do you work essential academic content into games? 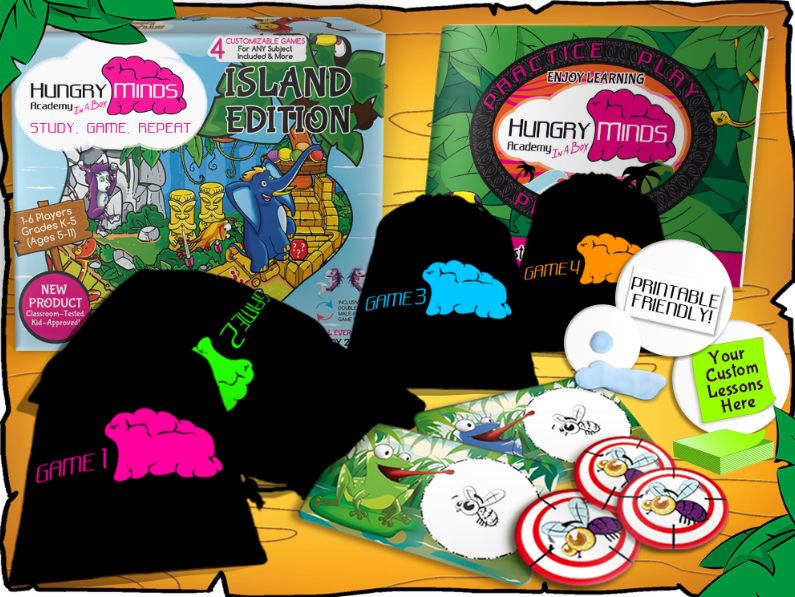 The studies referred to found the most common error teachers make when using games is after the games are complete. Often teachers just add up team points and move on. They miss out on the opportunity to debrief to go over aspects that are now clearer, were most difficult at the time, etc. Q4. How long do you debrief after games, and what do you discuss? Another boost in the effectiveness of games in the classroom was found in having students take notes on the game/lesson afterwards. Or to allow students to go back and correct homework, etc. with this new knowledge. Q5. 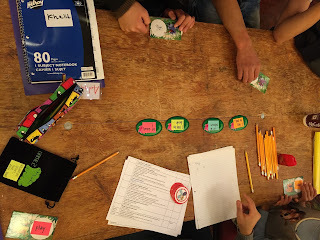 How can you have students reflect or act on what they learned from their participation in games?